It's always sad when the last postcard arrives. I got all 10 rather quickly this year. I wanted to share them all with you. It always amazes me how different they all are. The cards on the right are from Jenny Pesavento in Colorado Springs,Liven Geelmuyden in Norway, Kit Wojcik in Long Lake Minnesota, Jeane Sliney from Duluth Minnesota and Charlotte in Sweden. One thing you can't see in the photo is the back of Jenny's card. It has a little pouch with a secret message. Such a cute idea. Charlotte put two cards in a large envelope. Double surprise. Nancy actually painted 4 cards then cut them apart into smaller cards. Jeane used a piece of corrugated cardboard for hers. All very original. 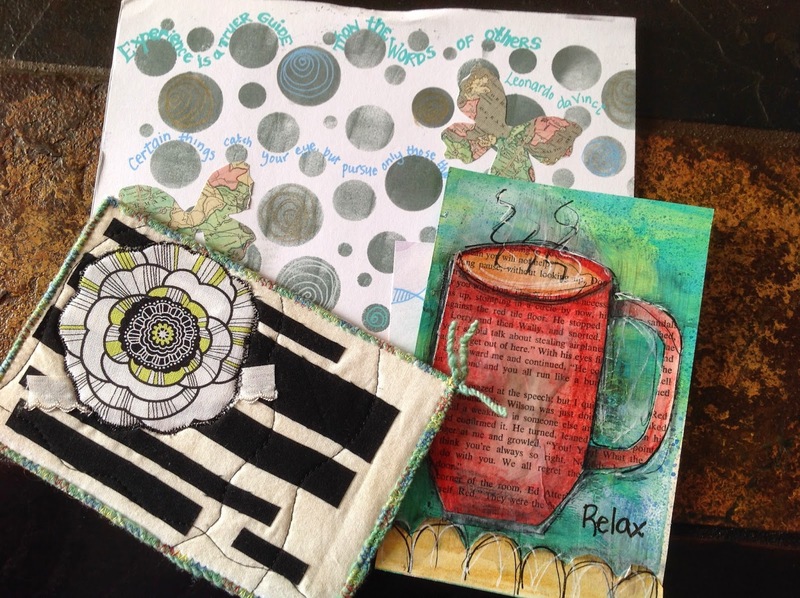 On the left, postcards from Linda Hartzig in Gastonia North Carolina, Eleaca Young in Cantwell Alaska and sally-Ann Garret on the Isle of Wight in the UK. I must apologize to Eleaca for not sending a thank you. You didn't give me an email address. I do love the card with my morning coffee. Linda's card is the first I've ever received made entirely of fabric. It's appliqued and quilt stitched. Sally's card was the largest. I love them all. Thank you so much. 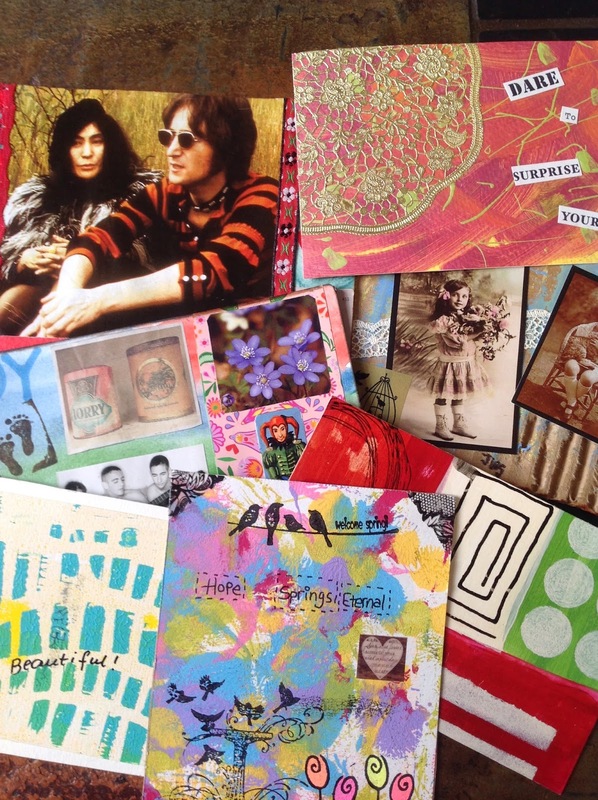 Thank you ihanna for hosting another great postcard swap. I do look forward to this each year. Hugs to all, thanks for visiting. PS: I found Eleaca's website, finally got to thank her for the cute card. YOu are very welcome. I am so happy you liked it.